Wallace Township in Perth County, Ontario began to be settled in the mid-19th century. As farms were cheaper than in Waterloo County, about 10 Mennonite families from Waterloo County moved there from 1864-1869. Ministers from Waterloo conducted services in homes every eight weeks from 1865-1867, and thereafter every four weeks. Montezuma Brothers obtained the six acre triangle, then known as "The Gore" on the sixth line of Wallace from the Crown in April 1867. Soon he donated one acre of this land to the Mennonite congregation for a meeting house and cemetery. Thus this location was called Brotherston. The first burials took place before the meetinghouse was built in 1871. The first structure was a rather crude frame building with board siding. The first resident minister for this congregation was Isaac Weber who had been ordained in 1869. Levi P. Martin was ordained deacon at the same time. Levi's wife died 25 December 1869 and was the first adult to be buried in the Brotherston cemetery. A child had been buried there in 1867. Early family names included Kurtz, Snyder, Bowman, Schuk, Shoemaker, Knipe, Hood, Denny, Martin, Loggins, Karges, Reichard, Shaus, and Brothers. At the height of the community from 1869-1875 there were about 50 members. However half of the congregation began to affiliate with the "New Mennonite" movement. The more conservative faction separated from the "New" Mennonites, but shared the meetinghouse for a short time. When the New Mennonites claimed the building and installed lights and built a shed for the horses, the conservative group ceased using the building and held services in homes until another meetinghouse was built in 1882 in the neighboring village of Kurtzville. The progressive group had various names, though Wallace Mennonite Brethren in Christ was the most longstanding. 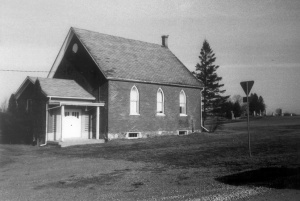 Due to a decline in membership the remaining members transferred to the Palmerston Missionary Church in 1972 and the meetinghouse was intended to be sold. Markham-Waterloo Mennonite Conference families from the Markham area north of Toronto, and also from Waterloo County bought farms in the Brotherston vicinity from 1968-1972. Services were held in homes in 1971-2 until Bishop Abraham Smith moved to Wallace Township from Markham in 1972. For one year a church at Mayne's Corners was rented for services. When the Brotherston church building became available in 1974 it was an opportunity for the Markham-Waterloo group. A congregation of about thirty-nine members began services in the newly acquired building every third Sunday. It was known as the Brotherston Mennonite Church. Ibra Martin was ordained as deacon in 1973, and John Drudge as minister in 1974, to assist the aging bishop, Abraham Smith. Smith died in 1980, having served in the ministry for 53 years. Difficulties emerged in the young congregation, and Deacon Ibra Martin terminated his affiliation with the Markham-Waterloo Conference. in 1981. Minister John Drudge did the same in 1984. In 1985 the membership had dropped to 11 members. Three newly married couples moved into the area in 1986 and this began a time of steady growth. Edgar Bauman was ordained minister in 1988, and Elmer Bearinger as Deacon in 1990. With the increasing membership, the old facility was becoming taxed. In spring 1993 the congregation decided to demolish the deteriorating structure and to erect a new one on the same site. The new meetinghouse followed the customary Markham-Waterloo pattern -- a plain frame structure clad with yellow bricks, no electricity, segregated seating for men and women, etc. Services were scheduled in rotation with the other Waterloo area congregations and thus is used for worship half of the Sundays. Since the new building had eliminated much of the parking space, additional more suitable parking space was purchased in 2001. Family names in the congregation at the time of the reconstruction included Martin, Smith, Horst, Wideman, Riebel, Metzger, Bearinger, Bauman, and Weber. Hiebert, Esther. "History of the Markham-Waterloo Conference," Research paper, 1980, Canadian Mennonite Bible College, 62 pp. Martin, Donald, Old Order Mennonites of Ontario : Gelassenheit, Discipleship, Brotherhood. Kitchener, ON : Pandora Press, 2003. Bauman, Edgar. 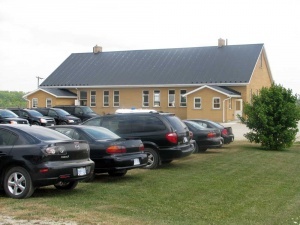 "Brotherston Mennonite Meetinghouse (Gowanstown, Ontario, Canada)." Global Anabaptist Mennonite Encyclopedia Online. October 2003. Web. 19 Apr 2019. http://gameo.org/index.php?title=Brotherston_Mennonite_Meetinghouse_(Gowanstown,_Ontario,_Canada)&oldid=143187. Bauman, Edgar. (October 2003). Brotherston Mennonite Meetinghouse (Gowanstown, Ontario, Canada). Global Anabaptist Mennonite Encyclopedia Online. Retrieved 19 April 2019, from http://gameo.org/index.php?title=Brotherston_Mennonite_Meetinghouse_(Gowanstown,_Ontario,_Canada)&oldid=143187. This page was last modified on 14 January 2017, at 13:34.